Turandot opens in just 18 days, so it's time to start getting to know our cast! First up, we chat with Georgian soprano Lina Tetriani, who makes her company and role debuts as the slave girl Liù. Tetriani will alternate in the role with Italian soprano Grazia Doronzio (also making her company debut), and sings on opening night, August 4, as well as the performances on August 11, 15, 17, and 18. Below, we ask Tetriani about her Georgian background, what kind of roles she loves to perform, and what makes Liù so special. First, welcome to Seattle! Can you tell us a bit about your background and how you started singing? I’m from the country of Georgia, which is a part of the former USSR. We immigrated to the United States about 17 years ago, to Brooklyn, and that’s where I still live. I started out as a pianist, and I’d also always had a passion for theater and music (I’m used to hearing singing in my family; music is very much a part of my culture). When I started singing, I auditioned for a pre-conservatory department for young kids at the conservatory in Georgia, and later I went to the Juilliard School. That’s how it all started. Have you ever sung in a Georgian opera? No, but I sang a lot of Georgian songs while growing up. There are lots of Georgian operas, and they’re gorgeous—big operas, with big choruses and many dancers. Paliashvili is one of the composers who wrote beautiful operas in Georgian. And they’re really well-written, but…they’re in Georgian! It’s a hard language to learn and sing, unless you speak it already. It’s hard enough when people have to sing in Czech. Georgian? Forget about it. Lina Tetriani (Liù) in rehearsal for Turandot. So which roles do you tend to sing? Mimì, definitely. I could do La bohème a million times and not get tired of it. I’ve done Musetta, too—actually, I sang both Mimì and Musetta in the same production, years ago, in Sweden. You mean, you alternated between both roles in the same performance? Yes! It was an interesting experience. It was very busy. But I loved it because the characters are so different and it was very interesting to tap into one side of your personality, and then the other. I love Puccini because he injects so much passion, and the stories are so complete. I think all the great operas have a powerful story behind them, and Puccini does that so well. I also love Gounod; I recently did Marguerite [in Faust]. I’ve also done Massenet, some Verdi, and Mozart. What is it that draws you to particular roles? What’s the most important thing for you, as a performer? It’s always very important for me to connect with a character (although I love a challenge). For me, really living the character on stage is extremely important and I feel like I cheat myself and the audience if I’m not completely singing the role and delivering in that sense. That’s the number one thing: I have to feel the role in my gut. That’s why I love Puccini. He’s so great at making that happen. 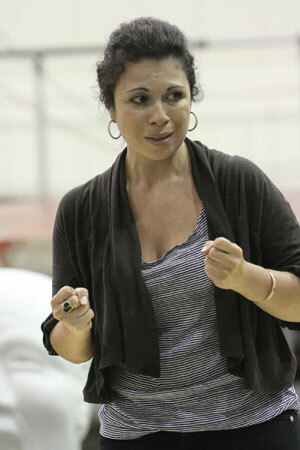 Lina Tetriani (Liù) in a Turandot staging rehearsal. This will be your role debut as Liù. How do you find yourself connecting with her? Liù sings a lot of beautiful music in Turandot. Do you have a favorite moment? I wouldn’t say I have a favorite aria. Why? Because everything she sings is like a little jewel, like a little diamond, in the way it was written. You can tell that Puccini put his heart into the character. Every phrase is meant to be there, there are no extra notes; it’s such a complete character. She’s also not one dimensional at all, and I think she has a wonderful combination of vulnerability and power. She’s very feminine and loving, and she’s brave because she’s not afraid to love. 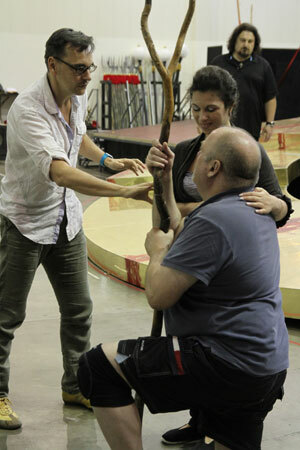 Renaud Doucet (Stage Director and Choreographer) works with Lina Tetriani (Liù) and Peter Rose (Timur) in staging rehearsals for Turandot. How would you describe Liù’s relationship with Timur? She’s his slave, but there’s also a genuine affection there. Yes. I think it’s important to portray that she is a slave, because so much of that culture is about knowing your role in society. But at the same time, their relationship has gone beyond that. She’s seen Timur in his most vulnerable state. In the beginning of the opera, he falls—he, a man who used to be a king—and Liù has to try and pick him up. She’s done all kinds of things for this man, and has taken care of him, and he’s constantly holding onto her shoulder. He knows her spirit so well, so that’s why it’s so painful for him when she dies. So I don’t think he sees a slave in her. I think he sees a beautiful spirit.